We love it when we get the chance to brag about how great our clients are doing. And we've got a new one for you! Woodbury Lutheran Church (www.woodburylutheran.org) launched and is taking off. We couldn’t be prouder of them and the way their church website is performing. We worked with Joel Symmank, the Director of Growth at Woodbury Lutheran and we're excited to share the story of their success with you, too! Woodbury wanted their website to provide a great welcome for those looking for a church home in their area. As well as greeting new visitors, Woodbury Lutheran knew they needed to help site visitors know what to do and where to click next. Woodbury knew their church website needed to provide a way to share and get excited about their ministry in new and meaningful ways (programs, sermons, event registration, and other kinds of community engagement). 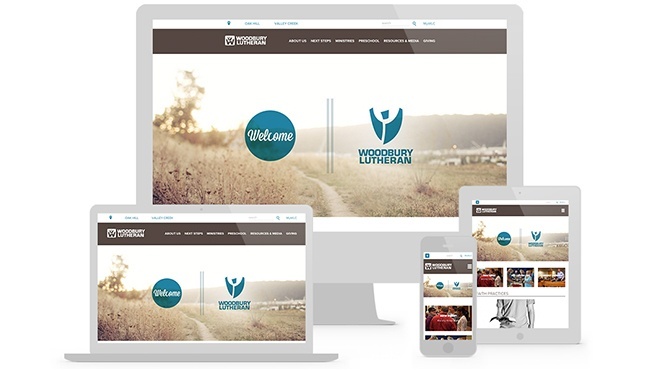 The Woodbury Lutheran website was able to make the transition from “hot mess” with lots of visual clutter, jargon, and confusing visitor paths to a strategically planned website. They built something streamlined and clear and they are seeing engagement and an increase in user involvement across several channels. Their new website is well-designed, useful, and is allowing them to move on to other phases of their growth -- we even hear rumors of them starting another campus soon! Woodbury Lutheran has been truly impacted by their new website. They’ve been able to pursue their goals and drive forward on the path of their growth plan. Take a look at how much more use these pages are getting. And these are only the numbers at their 90-day review -- imagine the growth over time! Site Visitors - Woodbury saw a 23% increase in the number of site visitors (that’s roughly 1,500 more than the same time period last year). Mobile Traffic - Woodbury saw a 49% increase in people accessing their website on mobile devices. 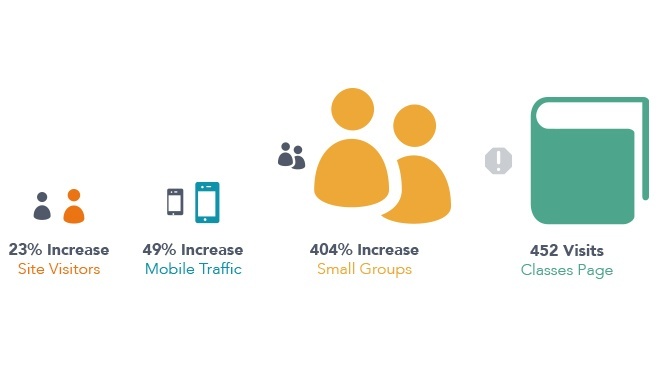 Small Groups - Woodbury saw a 404% increase in traffic on their Small Groups page. That’s pretty crazy successful. Classes Page - This result can’t even compare to their old site because they didn’t have a Classes page. We love how quickly this number is climbing. 452 people visited the “classes” page -- and this was one of Woodbury Lutheran’s major goals. We think they are majorly winning. Social Growth on Facebook - In that time, 132 people that were on Facebook came to the Woodbury site. Social Growth on Twitter - In that time, 40 people found the Woodbury Lutheran website on Twitter. As you can see from their stats, website usage has gone off the charts. Their website has become a true hub for Woodbury Lutheran. It has become critical for them, as more and more of their congregation (and more and more new visitors!) heads to their website for answers and information. The Ekklesia 360 strategy team worked through a Mission Online Assessment with Woodbury Lutheran and coached them through the results of a series of audits. The Ekklesia 360 strategic coaching team helped them discover the strategy that was perfectly aligned for the best results for their ministry and how they wanted to see growth. We walked with them through a series of meetings, met with their team and our designers, and the rest was history. This is a page where Woodbury intends for their congregation to enter a friend’s email address and invite them to join an event. This works for Sunday worship or special events. Spiritual growth and maturity are important at Woodbury Lutheran. One of the main ways they are promoting their effort to “Worship, Growth, Service, and Outreach” is a Class Finder. They can sort with filters, by life stage, topics, and campus. We embedded Prayer Engine on their site. Prayer Engine allows users to submit prayer requests anonymously or publicly. This has allowed Woodbury Lutheran to unite behind each other and to be really deliberate about the ways they support each other in prayer. We were able to help Woodbury explain themselves to their community and arrange their website in a way that is easy to navigate for both new visitors and regular attendees. The Woodbury Lutheran team really worked on the content, pared it down, and zoomed in on ways to make it clear and organized. Their site can now deliver content to readers in more effective ways. It’s not the haphazard and visually overwhelming homepage they had before. Going through the Ekklesia 360 Content Strategy Process was valuable to Woodbury Lutheran because of how that’s played out with their new website. A growing number of site visitors are accessing the areas of their site that Woodbury wanted them to see. We can tell that the strategic decisions they made are, indeed, helping Woodbury Lutheran. Ekklesia 360 can help you achieve real ministry results.